The Canadian premiere at Obsidian Theatre. 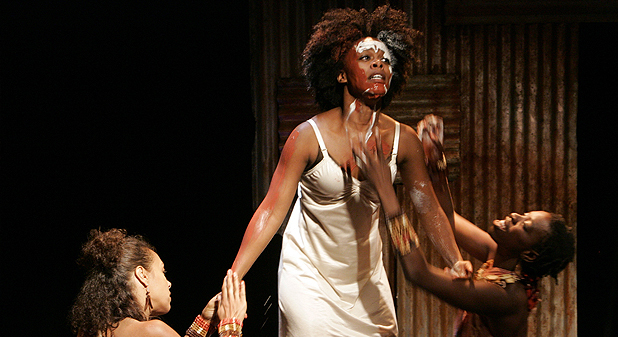 Synopsis: “Black Medea is Wesley Enoch’s richly poetic adaptation of Euripides’ Medea. Blending the cultures of Ancient Greek and Indigenous storytelling, Enoch weaves a commentary on contemporary Aboriginal experience.” (Synopsis taken from here). What moved me: The brilliance of this work is the deftness with which Enoch has insinuated the Medea narrative into the indigenous Australian landscape. Just as Medea helped Jason in his quest for the Golden Fleece, so here does Medea help her love gain mining access to the ancient land of which her community act as guardians. I also loved the space Enoch creates for the theatre-makers to enter into this work, with significant chunks of text given in images instead of speech. MEDEA: I had a dream. I dreamt I was staring into the desert and felt I would never be alone. In this dream my mother’s standing there smiling, her hair playing in the wind. She doesn’t say anything, she looks at me with a quiet smile. Beside her stands my grandmother. She looks just like my mother only she’s got more history in her face. Her hair’s tied back. This woman of law and language, standing ankle deep in the sand. Behind her another woman, looking at me, I can see my reflection in her eyes. She looks familiar. Her skin’s dark and weathered. Beside her another woman, and another and another, and then I can see an ocean of women stretching back out into the desert, stretching out to the horizon making the sand dark…standing facing me, looking to me.